VIX and XIV moved in same direction? Both VIX (S&P 500 volatility index) and XIV (the inverse) decreased price today. Aren't they supposed to have the exact opposite percentage gain/loss intra-day? For the sake of readers not familiar with these instruments, let's first consider some elementary background information. 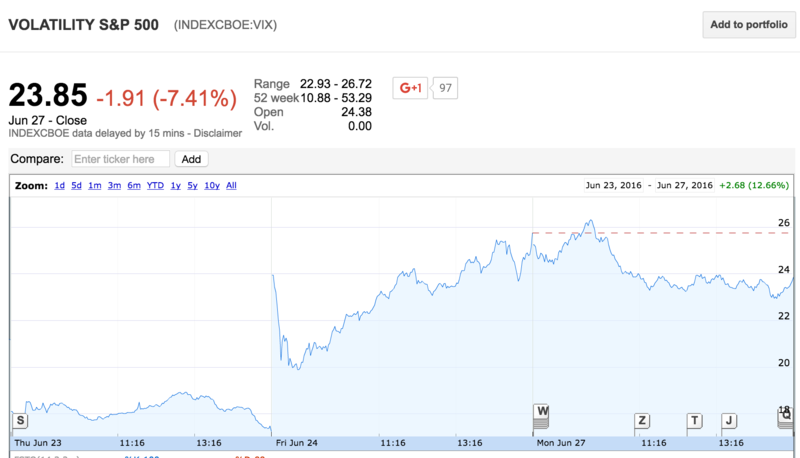 The CBOE VIX index is a spot index which is not tradeable. Gaining exposure to the spot VIX is only achievable by trading the CBOE VIX futures contracts (or products based on these futures such as the XIV). 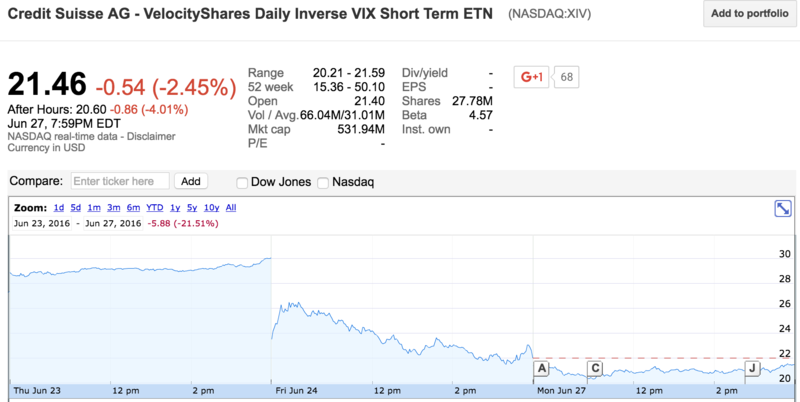 The XIV ETN is an exchange traded note that seeks to replicate the inverse of movements in the VIX on a "daily basis". It does this by selling futures contracts in the nearest two forward months. Futures prices are never equal to spot prices. In the case of the VIX, futures prices can include an element of speculation as to what the level of the VIX will be in the future (as well as technical factors relating to interest rates). Normally futures prices will trade at a premium to spot prices - this is called contango. However, in times of extreme volatility this can change so that futures prices will trade at a discount to spot prices - this is called backwardation. CBOE VIX near-term futures have been trading in backwardation for the last few days. This indicates that the market believes that the high levels of volatility seen in the last few days will subside in the near-term. If this perception proves to be correct, as it has done, then the level of backwardation will narrow and futures prices will move back towards spot prices and eventually return to contango. This difference in relative price movement between futures and spot prices is what accounts for the difference in performance that you have noted between spot VIX and the XIV ETN. Not the answer you're looking for? Browse other questions tagged etf volatility leveraged-etf vix or ask your own question. How should I use the Volatility Index? Why is volatility in a positive direction clubbed in the same risk category as volatility in a negative direction? What prevents leveraged ETFs from exceeding their underlying value in times of high demand?